While hip-hop is the musical genre most known for beef, rock excels at it, too. Over the last half-century, rock bands and artists have picked fights with each other, as well managers, reporters, corporations, and politicians. The rebellious attitude that's so synonymous with rock stars extends well beyond the aggression they channel into their music. Rock artists aren't expected to hold their tongue, and if history is any indication, they don't. The impetus for the genre's greatest feuds has been everything from forbidden romance to creative differences. Most conflicts are unfortunate, effectively splitting up legendary bands and ruining relationships, but they're always entertaining. 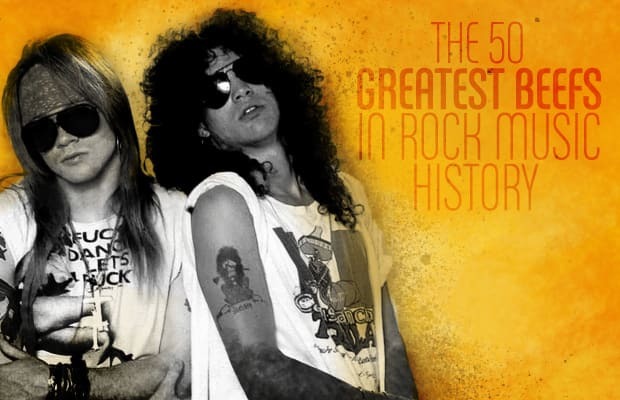 If you need proof, continue reading and check out The 50 Greatest Beefs in Rock Music History.